Caught between two brothers…How will she ever find love..? Miss Julia Bellevue was always a quiet girl who took no part in the cruel games of the Ton. But that was before she became engaged to Lord Fawkland and entangled with his equally handsome brother, Cedric. Despite Julia’s betrothal to Lord Falkland, his own brother! How can Julia accept a man who would shame her? Worse Julia feels she may be falling in love with Lord Fawkland. But why should he still want to marry her now? Why should anyone? 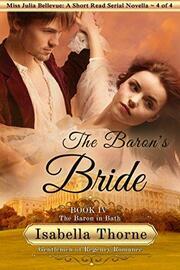 The Baron or his brother… and if she can truly trust either man with her heart?